This Australian red cedar is located in the grounds of The Elms Mission House at 15 Mission Street on the northern point of the Te Papa Peninsula, Tauranga. Formerly labeled as a Japanese walnut, a sample was sent to the SCION Herbarium in 2005 and was sunsequently was identified as Toona ciliata. View the herbarium record here - Accession no. NZFRI 25504. This tree is a more recent addition to the garden planted during Duff Maxwell's occupation of the site, circa 1969. 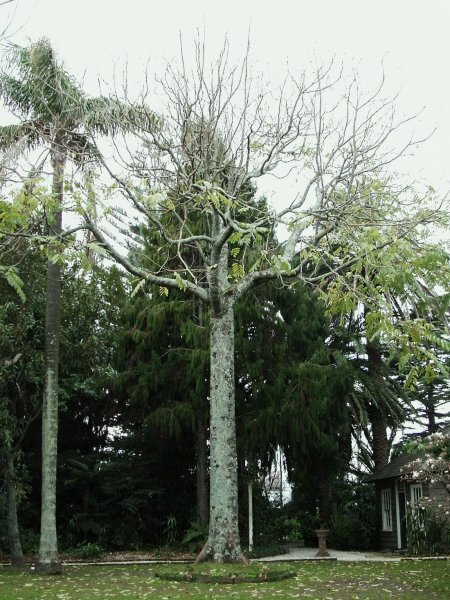 While this tree is not particularly old or particularly large; it is worthy of note, as it is uncommon in this area being thought to be the only example of the species in Tauranga and the Western Bay Of Plenty area (P.O. Sale 2013). A straight tall trunk with a wide spreading (umbrella shapped) crown.